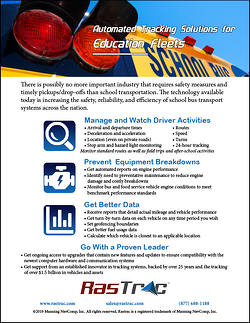 Education fleet vehicles are crucial for keeping scholastic organizations operating smoothly. Providing reports on driver behaviors, making for safer drivers. Always being able to track current locations so buses full of children don't get lost. Prevent equipment breakdowns by getting automated remote diagnostics reports. Improve route planning for greater efficiency of vehicle operations.